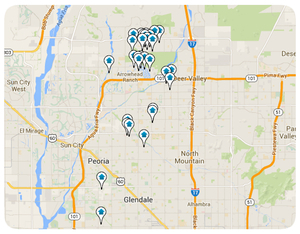 Rovey Farms is an excellent Glendale neighborhood located just South of Glendale Rd and 83rd Ave. Situated on larger than average lots, the homes in this particular subdivision seem to maintain value a little better than surrounding neighborhoods. Just minutes away from the Westgate Entertainment District, schools, shopping and recreation, this family friendly neighborhood offers affordable and quality homes that are a great place to rest your head.